1834 Investments Limited (1834) posted operating income of $21.87 million, a 37% decline when compared to $34.81 million reported for the comparable period in 2017. For the quarter, operating income fell by 46% to $6.73 million (2017: $12.36 million). Other income decreased by 50% to $37.16 million (2017: $74.54 million). Other income for the quarter closed at $1.36 million (2017: nil). As such, total revenue for the six month amounted to $59.03 million, 46% below last year’s corresponding period of $109.35 million. Total expenses increase by 67% from $57.80 million in 2017 to $96.44 million in 2018. Of total expense, administrative expense went up by 29% to close at $21.21 million (2017: $16.49 million), while other operating expenses increased by 82% to $75.23 million (2017: $41.31 million). As such, profit from operations plunged from a profit of $51.56 million to loss of $37.42 million for the nine months ended December 30, 2018. Loss from operation for the quarter amounted to $62.84 million relative to a loss of $4.79 million for the corresponding quarter of 2017. Finance cost for the period amounted to $83,000 compared to $37,000 reported for the comparable period of 2017. Share of profit from interest in associate, net of tax totalled $5.51 million compared to $53.04 million booked twelve months earlier. Loss from disposal of subsidiaries amounted $24.97 million compared to nil in 2017. Consequently, losses from operations before taxation amounted to $56.96 million versus a profit of $104.56 million for the same period in 2017. For the quarter, loss from operations before taxation closed at $85.95 million relative to a profit from operations before taxation of $43.21 million in the prior comparative quarter. Tax charges of $2.60 million were incurred for the nine months period compared to $15.33 million reported in 2017. As such, the loss for the period amounted to $59.56 million relative to profit of $89.23 million for the prior year. 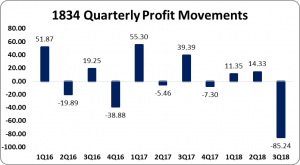 For the quarter, 1834 posted net loss of $85.24 million versus a net profit of $34.37 million in the previous corresponding quarter. The loss per share (LPS) for the period amounted to $0.049 in comparison to an earnings per share (EPS) of $0.074 in 2017. For the quarter, LPS of $0.070 versus a earnings per share (EPS) of $0.028 The twelve-month trailing LPS amounted to $0.055. The number of shares used in this calculation was 1,211,243,827 units. As at March 28, 2018, the stock traded at $1.10. The Company, as at December 30, 2018, recorded total assets of $1.58 billion, a decrease when compared to $1.77 billion recorded last year. The movement was attributed to decrease in ‘Investments’ which closed the period at $295.34 million (2017: $491.41 million). Total Shareholders’ Equity as at December 30, 2018 closed at $1.52 billion, a decrease from the $1.69 billion recorded for the same period in 2017. This resulted in a book value of $1.257 compared to a value of $1.397 as at December 30, 2017.